Has anyone else noticed in their environments MacOS agents losing some or all of their client settings? We use client settings extensively for inventory tagging and distributed management, so they’re very important to us. We currently see almost 10% of our MacOS agents in this state (thousands of systems). I’d like to see how widespread this issue is. Anyone else seeing this happen? This has been happening in my org to Macs running 10.10 and above for several months now. Some problem clients are running 9.5.7 and others are running 9.5.9. I have long noticed Mac clients lacking relay affiliation settings. I’ve never tracked it enough to determine if they had them and then lost them. They tend to appear in units that are probably using older installer packages that might not have the settings I’d later baked into the clientsetttings.cfg. Or, they have older clientsettings.cfg that I later replaced with a more barebones file and relevance/actions to control settings. Possibly related, I’ve had cases (mostly Windows, a couple Mac) where the client gets seemingly wedged — it checks in and shows as online, but doesn’t process actions. The only solution I’ve found is to forcibly remove the client and all data (e.g. BESRemove.exe) and reinstall. These cases seem to be rooted in horked disk permissions on the client. Do you know how settings are generally configured for the Macs / others? Do you primarily use clientsettings.cfg to set initial settings? Are you using actions / policy actions to set some settings generally? 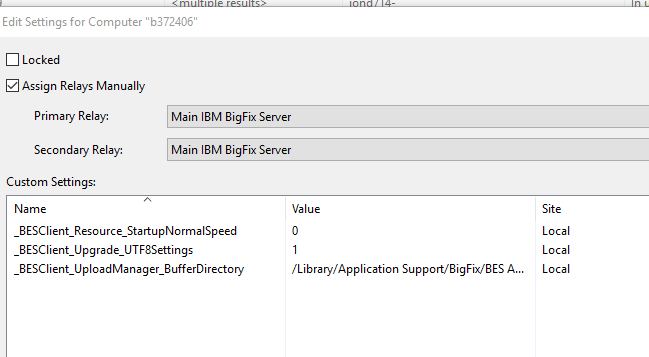 Are you using Defaults Write or something similar on the command line to configure settings before or after BigFix is installed? Is there anything that would trigger client settings changes occasionally? 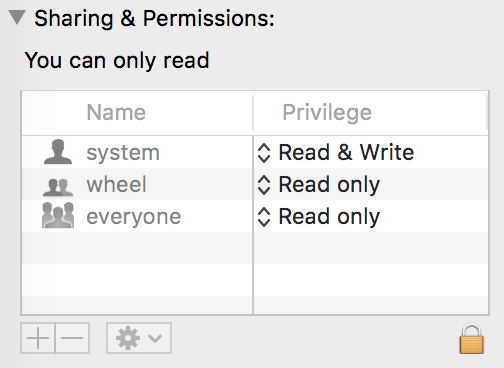 What are the permissions set to when they are good? What are they set to when they are not? I don’t actually know if these are correct, but they seem to be and are what is on one of my systems. It would also be interesting to know the contents of the plist before and after they lose settings if possible, as well as the modification time of it. If the settings are still in the file, even though they aren’t being reflected in the console, then I wonder what happens if you defaults write one of the settings that already exists to write it back again. It would also be interesting to know if the plists are in binary or xml format before and after losing settings. Some settings are configured at install time. Others via actions, later. At install time, I believe that our installer wrapper customizes clientsettings.cfg to set them. I don’t believe that we use defaults write to set settings manually as a general practice. Mac filesystem object inspectors don’t appear to read Unix permissions, so this is harder to answer remotely via Fast Query. Will try to get my hands on one to see. Under instruction from Support, I’m trying to gather client diagnostics from systems before and after the failure mode, so hopefully I’ll be able to answer this before too long. My Archive Manager functionality isn’t working well, but maybe we’ll get that resolved such that I can collect a large enough population of “before” client diagnostics to end up with a before and after. Quick playing via Fast Query indicates that on the good and bad systems the files are binary. This is still happening to several computers every week, despite running 9.5.9. Anyone having any luck with solutions to this? I’m still trying (at IBM Support’s request) to capture diagnostic data from an endpoint BEFORE and AFTER it loses all its client settings. Unfortunately, we have other trouble with our relay/root server infrastructure that’s preventing bulk gathers via archive manager from working, so we’re troubleshooting that first. But this is indeed still happening to us and we’ve made little progress on identifying root causes. All are on client 9.5.8; nearly all are running macOS 10.13.x. One I had reimaged personally, less than six weeks ago. Yes, we are still seeing this issue, although it seems to have gotten better since we discovered in the BigFix Slack that it mostly/entirely happens to settings which do not have effective dates, meaning that they were set in the clientsettings.cfg file at time of install. I haven’t had any computers in my test group lose settings since I pushed effective dates to their client settings, but I don’t know if that’s because I got lucky or it fixes the problem. @jtavan said that it didn’t fix the problem for him. That’s correct… I have a policy action in place setting effective dates for all machines missing them, and still seeing a dozen machines a day losing client settings. Still trying to work through it with support. Anyone else still seeing this? The filter is an Automatic group based on this property. The property is set in the clientsettings.cfg or manually editing the computer settings and applying the property with a value. So when the computer settings go blank, I can still see on the summary tab that the Computer Group memberships remain correct, but the acual reported settings in " edit computer settings" is totally missing along with all the other details like command poll enable and relay select etc. This is a big problem because that propery going missing meant the computer becomes orphaned from its department , not visible in any console except the master console. Re-applying the settings works for a while but they soon revert and loose everthing again… This is only happening on Macs… Less so on macs that are domain joined. We are still seeing this as well, and have thousands of computers in this state. I’m building some content now to pull data from our Splunk records of historical settings values and restore them to those machines where I can find appropriate previous values. Still happening for us too. Still here too, but less often now that I have a policy action that applies dates to client settings. Ok… I have just had it happen… I have been working on a mac which is Bound to a AD. It had a nice client setting combination to include the usual dept ident, the Command poll enable, number of seconds, Power tracking and a host of other settings. The Actions remained. A few seconds later, the Computer re-appears in Computers , and in the actions as the only target BUT all the Client settings had gone except for the “defaults” as pictured. Unsubscribed from FixSite and delete fixlets. Why did it basically unregister from nearlt all the sites and then re-register? Do you have logs starting from a few minutes before? This looks like everything that happens after a client reset, I’d like to see what was happening before and during. Sure Jason… I wont post them here as there is too much obfuscation to be done.